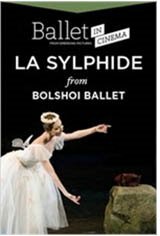 August Bournoville's 1836 drama about the love of a mortal for a magical sylph is a classic of Romantic Ballet. This version has been adapted by choreographer Johan Kobborg, and gleams anew at the Bolshoi Ballet. The story is set in the human realm of a small Scottish community, which meets the spiritual when James, a classic Romantic hero, falls for a beautiful sylph he's unable to touch.